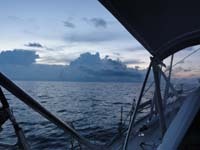 On the 25th of February 2012 we set sail in Phuket, Thailand, and started on our third crossing of the Bay of Bengal. 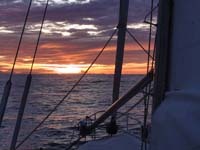 Ahead lay the 1,100 nm distance to Galle in Sri Lanka, which was the planned first leg of our crossing to South Africa. More than a year had passed since we last time departed from the same anchorage in Chalong Bay for a crossing of the Indian Ocean. As you know, in February 2011, we decided to abandon the plan to sail across the Arabian Sea to the Red Sea and instead returned to Phuket after a cruise in the Maldives. This time we were on a different route. However, the first leg would be almost identical to our previous trip, but now we had decided to visit Sri Lanka on the way. Last year we passed this large island just 5 miles off without stopping. Although end of February should still be well within the season of the NE monsoon the trip turned out to be almost 100% motoring in flat seas. Last year, when returning from the Maldives to Thailand in the transition season we were mentally prepared to motor all the way, but not this time - we motored more than 90% of the time! That is an awful lot of hours in 9 days. Fortunately we have big fuel tanks. The conditions, compared to last year when we even made a speed record, were quite extraordinary. The first five days we experienced calm, uneventful days and thunder and lightning every night. Sometimes it was pretty scary, but mostly the lightnings were between the clouds or inside a cloud and they seldom hit the sea - but you feel very small down there in your boat - I can tell you that. After these five days the nights were beautifu with starry skies and an increasing moon. Only drawback was the constantly humming of the engine. Between these two periods we had a fierce 7-hour storm from the SW - a direction completely unthinkable in the NE-monsoon (or so I had thought), which took us by surprise and in 7 hours blew us 30 nm off course. Except for that short storm, the seas were usually quite calm, even flat and the little wind we got was usually less than 5 knots and usually right on the nose. 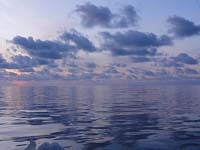 Frequently we crossed small areas of confused seas, loking like boiling water (photo above left). Apparently crossing currents were wrestling with each other. 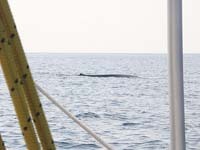 We had several visits by dolphins and twice we spotted 2-3 whales (photo above right and on top of this page). 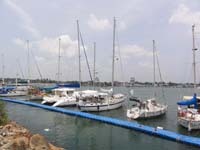 Using a shipping agent is mandatory in Sri Lanka, even for small pleasure boats. We contacted one of them to help us to cope with bureaucracy. Even so we couldn't avoid the bribe problem, which this harbour is well known for, but I will skip the details. Approaching the harbour we called Port Control, who told us to anchor outside the breakwater. Fortunately the swell wasn't too bad. An hour later we were boarded by the Lankan navy. Having checked our papers and opened cupboards until the found a bottle of whiskey they decided to give us permission to enter the harbour. I took the bottle from them even so, but gave each warrior two packs of Malboros, purchased for this purpose from Super Cheap in Phuket. You need to use your own bow anchor and take long stern lines ashore across a ricketty floating pontoon of plastic cubes, see photo above. We didn't risk tying only to the pontoon and took lines also to some big blocks on the break water (photos below). There is quite a surge running in the basin - we call it a bath tube effect. The civil war in Lanka is over, but the security still appears to be tight in the harbour. Each night the navy closes the harbour by a floating fence. 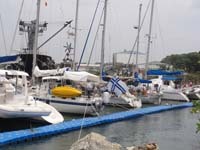 You can see them working on the construction on the other side of our yachts in the panorama above and on the photo below (left) it has been pulled across the entrance. Just a few years ago Tamil terrorists occasionally tried to dive inside with explosives attempting to blow up ships in the harbour. I don't think anybody has noticed it! A very interesting place, indeed. Our next report will be upoaded shortly. 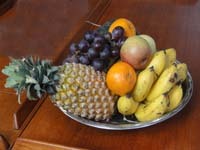 It tells about our excursions in Sri Lanka.